Advancis Refresh is a combination of silymarin, vitamin C, B-complex vitamins and caffeine. Advancis® Refresh thus helps reduce the unpleasant feeling caused by alcohol, tobacco or overeating. 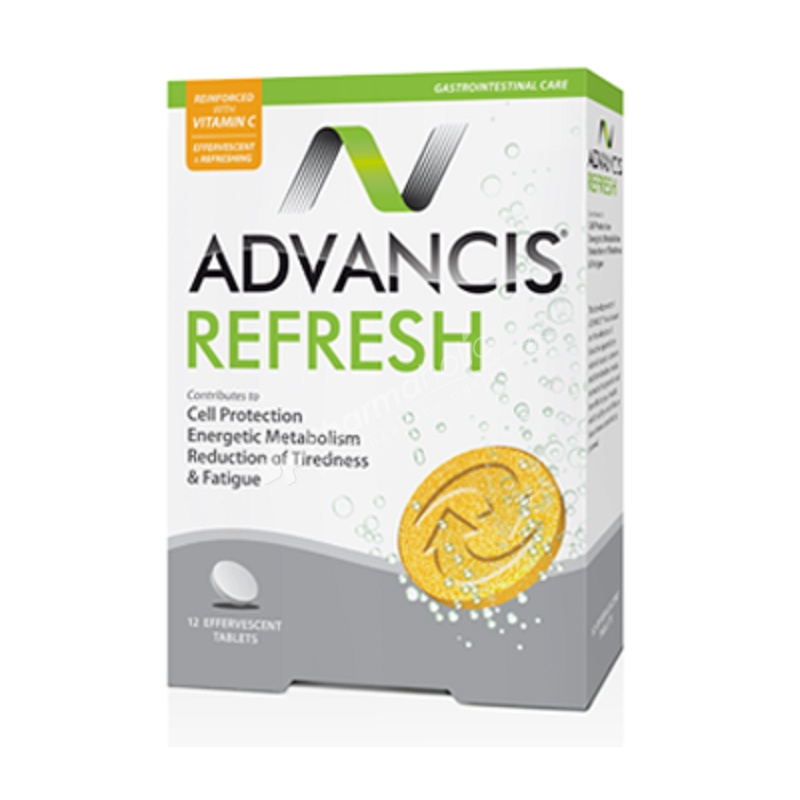 Advancis® Refresh is a combination of silymarin, vitamin C, B-complex vitamins and caffeine. These ingredients have detox and revitalizing action, while silymarin also present has an important liver protective and digestive action. Advancis® Refresh thus helps reduce the unpleasant feeling caused by alcohol, tobacco or overeating. Hepatoprotective and Digestive: Take 1 effervescent tablet dissolved in a glass of water before a food excess, alcohol or tobacco. If necessary, repeat the intake after the excess. Detox: Take 1 effervescent tablet after waking up, dissolved in a glass of water. Lactose; Polyvinylpyrrolidone; Acidity regulator: Sodium bicarbonate, Tartaric acid; Vitamin C (L-ascorblc acid) 13,6%; Anti-caking: Polyethylene glycol 6000; Silymarin (minimum content 40%) 5,3%; Acidity regulator: Citric acid; Flavour; Anhydrous Caffeine 1,5%; Flavour enhancer: Monosodium glutamate; Sweetener: Sodium saccharin; Vitamin B6 (Pyridoxine hydrochloride) 0,6%; Vitamin B2 (Sodium riboflavin 5'-phosphate) 0,15%.